Leave the gunk behind and keep your beer clear with this racking cane filter. A great solution at the right price. 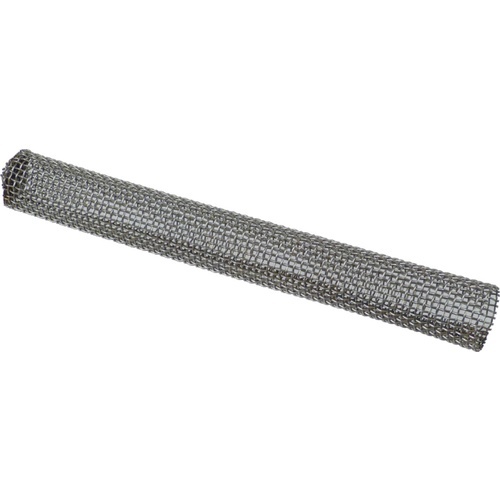 This Racking Cane Filter Screen is very effective when racking with whole hops, oak, or fruit in the fermenter. Simply slide this over the bottom of the racking cane and begin the siphon! Made from Stainless Steel mesh. Some customer are also using this in the their keg attached to the bev out dip tube. Fits on a 3/8" stainless steel racking cane. Note: You may want to use a hose clamp to tighten this to the racking cane. For dip tube filter, so I can dry hop directly in keg. Great for dry hoping with whole hops in the corny keg. Place on the end of a dip tube and dry hop in a keg. This will only fit over stainless steel racking canes, it will not fit over plastic ones. I use it as a keg dip tube filter for dry hopping. It fits perfectly with a hose clamp. Works very well with whole leaf hops. Not so well with pellet or powder hops. Technically 2 decades. This works perfectly for me with my stainless racking cane. I can dry hop with 4 oz pellet hops, without bagging them, and this screen filters it all out when I rack into an additional carboy or keg. Just don't slide the screen all the way up on the end of your racking cane. Leave a good 1.5" to increase the effective filtering surface. Works like a charm. Probably should've done more research before impulse adding this filter to my cart. I'd thought this would fit on the 3/8" auto-siphon, but it is meant to go over a simple racking cane, so was slightly disappointed when I opened the box. That said, this little filter works like a charm for its intended purpose. Works well. I added a worm clamp to hold filter in place on the stainless racking cane. Put these on all my kegs and haven't had an issue. Even using whole cone hops without a hop sock. Must have on the end of kegs! I have now converted all my kegs with these. Dry hopping is all done in kegs and I have also been able to put fruit in a keg without any clogging issues. A must! Great for racking off of dry hops. When I first saw these I was skeptical. I was looking to add whole leaf hops directly into a keg for dry hopping (no bag). My plan was to place them over the end of the drip tube, but I was worried that the small amount of exposed area would not be enough and clog while dispensing. Needless to say I was wrong and now these have become standard use for me in all my dry hopped beers. I tried several methods for dry hopping: hop sock with marbles, cheesecloth and nylon over the racking cane, etc. After using tube screen for the first time, I was able to minimize the loss of beer in the final transfer, and have not have to deal with any clogs or leaf particals in my bottling bucket. Nothing but clean clear beer to bottle for now on! I add whole cherries and raspberries to my sours, and while the real fruit flavor adds an amazing depth keeping chunks out and the siphon unclogged always took an enormous amount of work before I bought this simple screen. Well worth the small cost. I used to attach a piece of nylon mesh to the end of my racking cane to filter out the whole hops used for dry hopping. This works better and is easier to use. Well worth the small investment. Have you tried racking when pellet hops have been used? If so did it get clogged?